Internet experts say that there are currently over 150 millions blogs on the internet. That’s a huge number … does it surprise you? Blogs provide a quick and simple way to publish fresh content. Blogs invite interaction with the reader through their comment section. Blogs create a global platform to share information with the world. In this month’s post, we want to invite you to bring this powerful resource into your classroom, using the many blogs available for you as an educator from the Library of Congress. 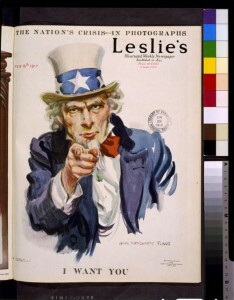 Have You Explored the Library of Congress Blogs? There are currently 13 blogs that you can access from the Library of Congress website. From the home page, you can scroll to the section near the bottom titled “Explore and Discover” where you will find the Icon shown on the right, which links to the page where all blogs can be perused. ==>Did you know there is a second verse to our beautiful national anthem? We invite you to listen and watch timeless treasures of primary sources in the video at the Library of Congress blog … then comment here (below) on our TPS-GSU blog to let us know if you think the second verse is as equally powerful and moving as the first verse! “The United States has many symbols, including the bald eagle, the Statue of Liberty, and the Liberty Bell. 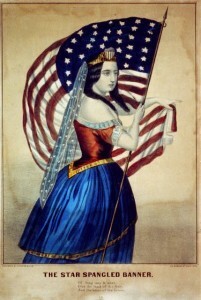 However, there is one that has been featured in a recruiting poster, served as a symbol of patriotism, and is a personification of the government of the United States of America. This symbol is Uncle Sam. …and to read the remainder of this post at the Library of Congress blog. The Statue of Liberty was a gift of friendship from the people of France to the United States in 1885 to commemorate the centennial of our Declaration of Independence. It stands over 151 feet tall and was designed by the French sculptor, Frederic-Auguste Bartholdi. 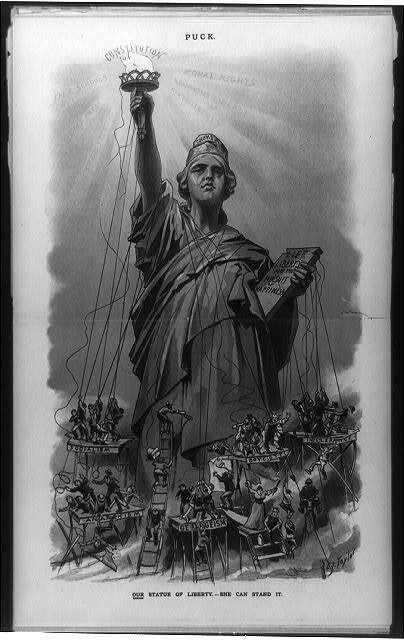 It was officially titled, Liberty Enlightening the World, and has stood in Bedloe’s Island in New York Harbor as a symbol of freedom and democracy to our nation – and to the world – for over 120 years. ==>We invite you to view the remainder of this Library of Congress blog post and to utilize the analogy of the French political cartoons featured there as valuable classroom activities. This month, our Feature Teacher Interview is with one of our TPS-GSU Coaches. Please tell me how you implemented this lesson plan in your classroom. I’m a reading specialist, so when I was taking this course, I knew I couldn’t use the information in a traditional way. I spoke with Teachers in my Building to see what topic they would be interested in having more resources about, and they mentioned electricity. I designed a unit around this topic and I designed this course for other teachers to use in 4th Grade classrooms. I wanted to take a topic that students don’t normally connect with on a personal basis and make it more engaging by bringing in primary sources from the Library of Congress. What has brought you the most value from TPS-GSU professional development programs? I really appreciate the variety of resources that the TPS-GSU program has provided or brought to my attention – by that I mean a full range. The incredible amount of historical research, already made lesson plans, the primary source sets by theme and topic of study, the copyright training, and the training in coaching. I really feel like knowledge of these resources has helped to make me a better teacher and a better coach. What inspired you to want to become an educator? I’ve just always wanted to be a teacher because I’ve always loved to learn, and I wanted to inspire students to enjoy reading books and learning as much as I did growing up. I love that look of wonder on their faces when they discover something new and they’re excited about something they just learned. What do you enjoy most about being a teacher now? I love that I get to work with the most challenged students, and these are the students who often haven’t had many experiences with books and reading. I really get to see the students as they begin to explore the power of reading and get to know themselves as readers. I’m also a multi-tiered system of support coach … in this role, I get to work with the teachers in my building helping to plan school-wide goals, and this has really brought a different perspective to my teaching and my own professional development. One way that it’s changed my perspective is that it’s given me a more global view of education to understand more than just the students in front of me and look at education from the bigger picture to achieve goals that are best for all students. Are there any recent achievements you would like to tell us about? I’m not sure that it’s an accomplishment yet, but I feel like it will be when it’s done. I’ve been working on the Summer Curriculum Committee and it’s challenging to pull together the resources and develop plans, but it’s also rewarding to see how a unit can come together around essential understandings. I’m trying to find ways to incorporate Library of Congress materials into the unit so that a new generation of learners can experience the value of these resources to bring history alive. Please tell me about yourself and your family. I live in Chicago with my husband and our boys. We have a 4 year old, an 8 month old, and a 10 year old dog We enjoy reading together and playing outside, walking and bike riding. They keep us very busy. I have a B.A. in Geography from Augustana College, Rock Island, IL, with minors in Environmental Studies and Biology. I have a post-Baccalaureate Certificate, which is my elementary teaching certificate, from Northern Michigan University, at Marquette, MI. In addition, I have a Master of Arts in Reading Education from Concordia University Chicago, in River Forest, IL. EDUC 7212: Register by Sept. 2nd!